Before calling for service, please try the suggestions below. The power supply cord is unplugged; Plug into a grounded 3 prong outlet. Time-delay fuse or circuit breaker of the wrong capacity is being used; Replace with a time—delay fuse or circuit breaker of the correct capacity. The power supply cord has tripped; Press and release RESET. A household fuse has blown, or a circuit breaker has tripped: Replace the fuse, or reset the circuit breaker. The On/Off button has not been pressed; Press ON/OFF. The local power has failed: Wait for power to be restored. Too many appliances are being used on the same circuit; Unplug or relocate appliances that share the same circuit. You are trying to restart the air conditioner too soon after turning off air conditioner; Wait at least 3 minutes after turning off air conditioner before trying to restart the air conditioner. Disturbances in your electrical current can trip (Reset button will pop out) the power supply cord; Press and release RESET (listen for click; Reset button will latch and remain in) to resume operation. 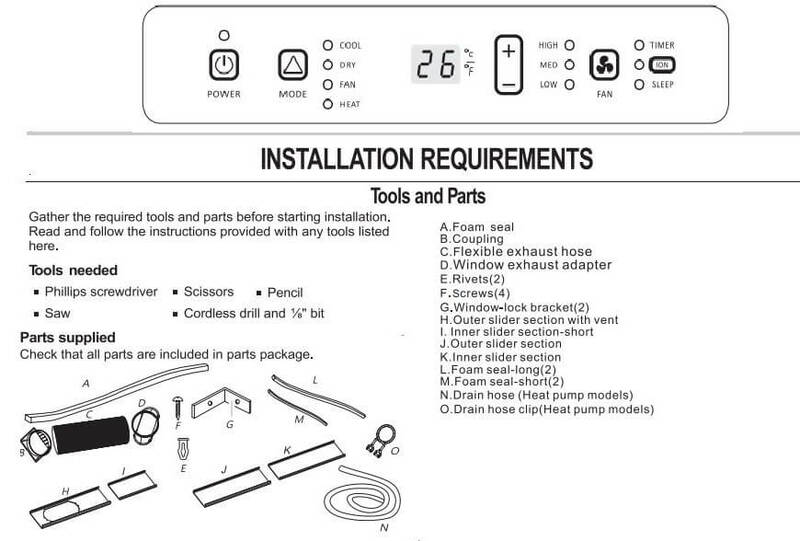 Electrical overloading, overheating, cord pinching or aging can trip (Reset button will pop out) the power supply cord; After correcting the problem, press and release RESET (listen for click; Reset button will latch and remain in) to to resume operation. If the power cord fails to reset, contact a service technician. NOTE: A damaged power supply cord must be replaced with a new power supply cord obtained from the product manufacturer and must not be repaired. Is there a door or window open? ; Keep doors and windows closed. The current air conditioner replaced an older model; The use of more efficient components may cause the air conditioner to run longer than an older model, but the total energy consumption will be less. Newer air conditioners do not emit the ” blast” of cold air you may be accustomed to from older units, but this is not an indication of lesser cooling capacity or efficiency. Refer to the efficiency rating (EER) and capacity rating (in Btu/h) marked on the air conditioner. The air conditioner is in a heavily occupied room, or heatproducing appliances are in use in the room; Use exhaust vent fans while cooking or bathing and try not to use heat-producing appliances during the hottest part of the day. 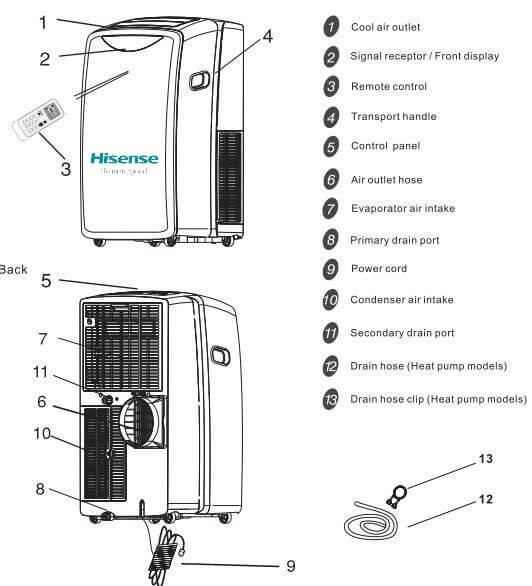 Portable air conditioners are designed as supplemental cooling to local areas within a room. A higher capacity air conditioner may be required, depending on the size of the room being cooled. If the unit displays error code E5, the water container is full. Drain the water, see “Draining the air conditioner”. After draining, the unit can be operated again. The filter is dirty or obstructed by debris; Clean the filter. Air outlet is blocked; Clear air outlet. 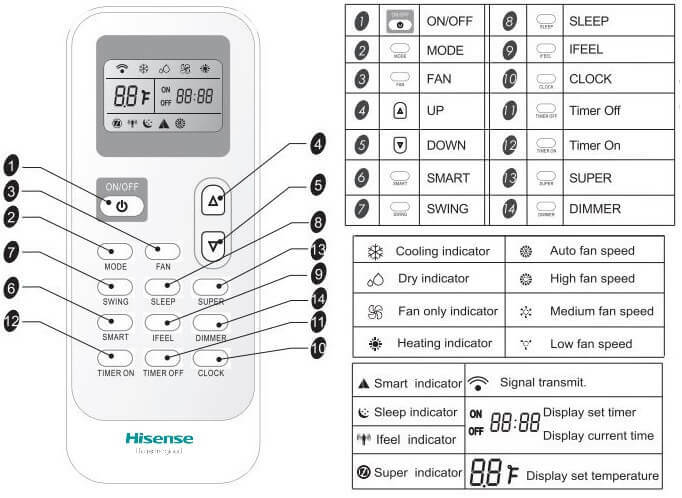 Set temperature is too high; Lower set temperature. The air conditioner is not properly sized for your room; Check the cooling capabilities of your portable air conditioner. 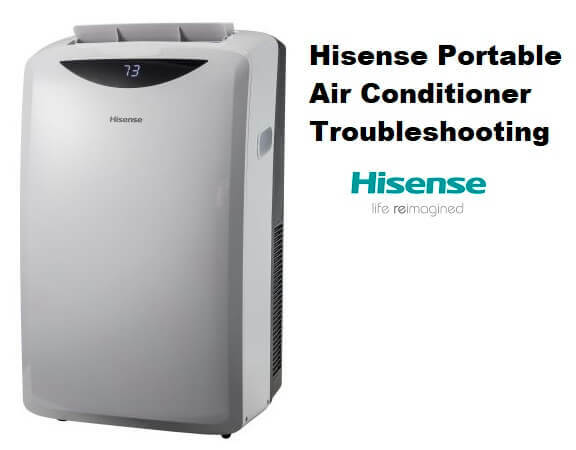 Portable air conditioners are designed as supplemental cooling to local areas within a room. There is excessive heat or moisture, open container cooking, showers,etc. in the room. Use afan to exhaust heat or moisture from the room; Try not to use heat-producing appliances during the hottest part of the day. The louvers are blocked; Install the air conditioner in a location where the louvers are free from curtains, blinds, furniture, etc.